Ever since starting HF operation in 2005, RTTY has been a mode dear to me. It was thus a natural progression to move into active RTTY contesting, starting with the 2005 CQ Worldwide RTTY event. Since then I try to take part in the major events (CQWW, CQWPX or RTTYRU) and have participated in many of the smaller events as well. 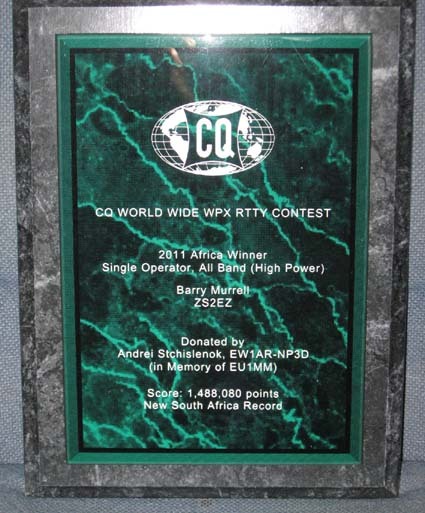 My highlights so far have been earning a plaque for #1 in Africa (SOAB HP) for the 2007,2009 and 2011 CQWPX RTTY events (new South African record score in 2011), #1 in Africa in the 2007 WAE Contest (the only time I have entered this particular event) and Continental Leader in the 2006, 2008,2009, 2010 and 2011 ARRL RTTY Roundups (SOAB HP). After a gap of a few years, I returned to contesting in the 2016 RTTY Roundup, making 176 QSOs. Damage to my antenna system however brought a premature end to my 2016 activities. I did however make a return to contesting in the CQ WW RTTY event in September 2016, running Low Power due to my amp having failed. My plaque for the 2011 CQ WPX RTTY Contest!!! Contesting from way down near the Southern tip of Africa (I am located in the city of Port Elizabeth, roughly 800km (500 miles) from the Southernmost tip of the continent) is very challenging. Propagation (particularly on 15m and higher) is nowhere near as good as our Northern neighbours (often 10m is open in Bloemfontein, some 500km North of Port Elizabeth, yet absolutely nothing is heard here!! There are hardly any regular RTTY operators within 2000km, with two of them (ZS2Y and ZS2DL) being in the same city as me, and not more than a handful of semi-regular operators in Southern Africa. Additionaly, Southern Africa is outside the general East-West beam pattern for NA and EU operators. Add to this a small suburban lot making antennas a challenge (the property is narrow, some 19m wide with a large swimming pool taking up considerable space), effectively eliminating 80m, and the posting of any sort of competitive score becomes a massive task! Despite this, contesting (particularly in RTTY) has become a really enjoyable pasttime!! I began contesting using MixW and a homebrew soundcard interface, coupled to a Kenwood TS-570S and TH3JRS yagi. This evolved into using N1MM Logger and MicroHam MicroKeyer II into a Kenwood TS-870S (with Kenwood TL-922 amplifier) and Cushcraft A3S yagi. I have bought and tried Writelog along the way, but found that I much preferred N1MM Logger! By January 2016 the contest setup had changed again, now consisting of a Kenwood TS-590S and Ameritron AL-811 amplifier with tne new N1MM Logger+ software. The old A3S was replaced by a HyGain TH-7DX during August 2016. Whilst I make a casual appearance in some of the other events, it will be in a non-competitive role. In recent times I have found my scores improving steadily, despite the extended solar minimum. As there are so few RTTY contesters in Southern Africa, I have found myself competing against my previous year's score in each contest, and generally improving on it! The 2011 CQ WW RTTY contest was my most succesful contest to date, and I was really disappointed to miss the 2016 event due to a broken antenna!!! !